In recent years scholars have re-evaluated the "parting of the ways" between Judaism and Christianity, reaching new understandings of the ways shared origins gave way to two distinct and sometimes inimical religious traditions. But this has been a profoundly textual task, relying on the writings of rabbis, bishops, and other text-producing elites to map the terrain of the "parting." This book takes up the question of the divergence of Judaism and Christianity in terms of material--the stuff made, used, and left behind by the persons that lived in and between these religions as they were developing. 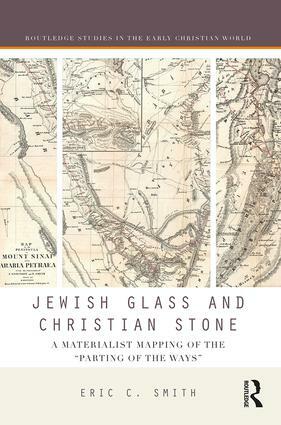 Considering the glass, clay, stone, paint, vellum, and papyrus of ancient Jews and Christians, this book maps the "parting" in new ways, and argues for a greater role for material and materialism in our reconstructions of the past. In this creative and groundbreaking study, Smith places material culture front and center as he explores the rich contact zone of the figurative "valley" between the "mountain peaks" that represent late Roman Judaism and Christianity as clearly distinct religions. Building on the recognition that modern concepts of religion, and with it understandings of Judaism and Christianity, distort our understanding of the Roman world, Smith rethinks early Christian/Jewish "relations" through a deep engagement with critical race theory, hybridity, and intersectionality. This accessible and engaging book contributes significantly to the study of early Christianity, Roman Judaism, identity-construction, and religion, and demonstrates clearly the value of the materialist turn. What can the physical remains of the past teach us about religion and community in antiquity? In this exquisitely crafted materialist reexamination of the so-called Parting of the Ways between Judaism and Christianity, Eric Smith reorients our thinking about the "raucous reality" of ancient lives on the ground. Stripping away the modern colonialist impositions of our "world religions" frameworks, Smith cogently pushes us to view ancient objects--glass, clay, marble, paint, vellum, and papyrus--not as evidence for clearly bounded religions, as singularly "Jewish" or "Christian" things, but rather as witnesses to the messy intermingling of identities in late antiquity. Eric C. Smith is Assistant Professor of the History of Christianity and New Testament Studies at the Iliff School of Theology in Denver, USA. Routledge Studies in the Early Christian World offers monographs and edited collections which explore the most cutting-edge research in Early Christianity. Covering all aspects of world of early Christianity, from theology, archaeology and history, to urbanism, class, economics, and sexuality and gender, the series aims to situate these early Christians within the wider context of Late Antiquity. Comprising both regional studies and broader thematic surveys, this series explores what changed with the advent of Christianity, what remained the same, and how early Christians interacted with, made sense of, and shaped the world around them. Aimed at early Christian scholars, classicists and historians alike, Studies in the Early Christian World is an invaluable resource for anyone researching this fascinating period.